Prague weekends have a broad appeal and are popular with couples, singles and groups. There is plenty to see and do, during the day you can tour round some beautiful buildings including Prague Castle which is one of the largest ancient castle complexes in the world, or you could take a stroll round the lesser quarter for a real ancient and atmospheric feel. For shoppers, Prague boasts a large range of modern shops and boutiques. The main department stores are located around Wenceslas Square and are open from 9am to 6pm Monday to Friday, until 1pm on Saturday and closed all day Sunday. A weekend in Prague is a great choice for fun seekers, the evening entertainment here gives visitors a wide variety of restaurants mixed together with some vibrant bars and nightclubs, all selling very reasonably priced food and drink. Little wonder that the popularity of the city has soared over recent years the buzzing nightlife has made Prague a top destination for a Stag or hen party or other social groups looking for a cheap weekend break. While there are many inexpensive hotels, Prague does have several 4 and 5 star properties if you would like to enjoy a luxury weekend or short stay. If you like to explore, the transportation around the city is quick, efficient and inexpensive. Tickets for the underground, trams and buses are interchangeable and the cheap prices make public transport the ideal way to get around during your mini break to Prague. Taxis are plentiful and reasonably priced, there is a maximum price on taxis within the city but not when travelling outside of Prague, therefore please agree the fare before commencing your journey. If you are booking in advance or looking for a last minute weekend break, then either search online or call Travel Empire. 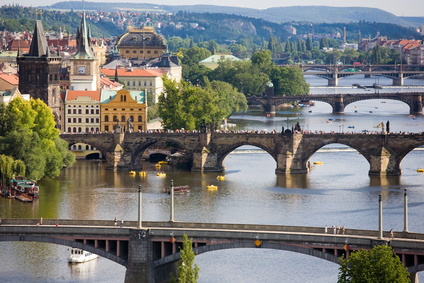 Prague short breaks are available from a wide choice of UK airports. Call us free on 0800 849 1285 or click here for a quote.